I was travelling to one of my favorite cities, Bern Switzerland, and decided it would be nice to document for a blog post Einsteins small apartment there. 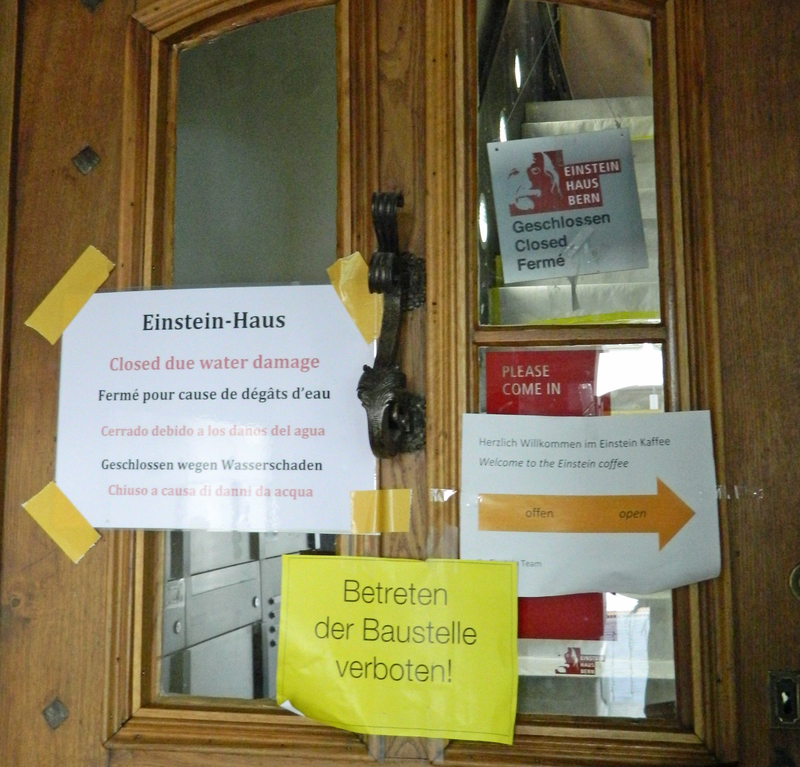 I had visited during a previous visit to Bern, and was eagerly anticipating my return visit. I was there bright and early with my camera, when I read this on the door. Not open? Who let the toilet overflow? You can imagine how I felt. Much like this bear, one of several the city of Bern has traditionally kept for good luck. I will instead have to go without photographs, to share my feelings from my last visit. You realize Einstein and his family lived for a time in this modest apartment, and modest is the key word here. The stairway to the apartment is small, it is on the “second floor” but three flights of stairs. The stairs become oddly shaped after the first flight. They are small and narrow. Your feet and brain need to work together, as they are far from the standard size we are used to. You go into the small apartment, and find you can tour it in only minutes. It is that small. There is one main room, overlooking the street. It is the living/dining/work room. 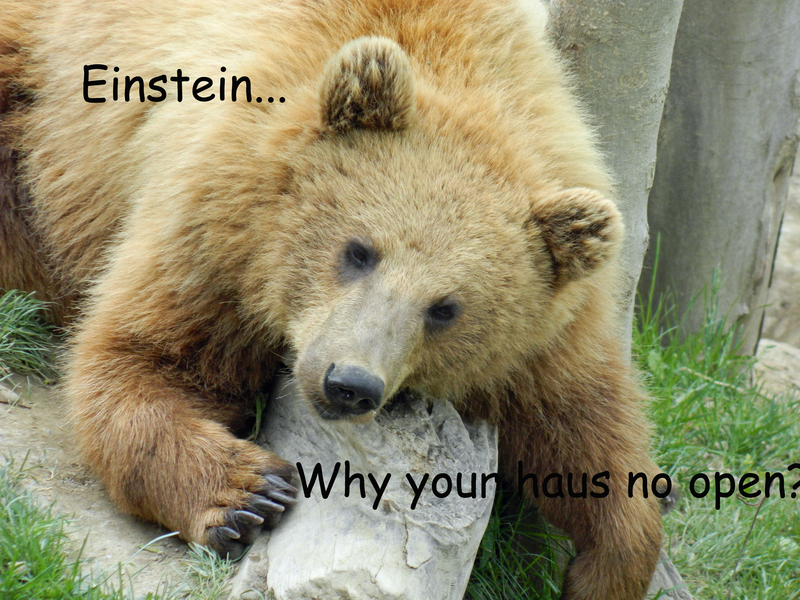 Einstein moved often while he was living in Bern working as a patent examiner. He worked 6 days a week. He had a wife and started a family. He also tutored students. The guide informed us he also met with friends in the evenings in the room to talk physics. I try to picture the great Albert Einstein, in this small room with wife, child, students and friends. It was while living here in 1905, he wrote the paper that would later result in his receiving the Nobel Prize. He also worked on his theory of relativity, resulting in the only formula almost anyone can recite at a moment’s notice. It must have been chaotic, and yet also somehow exciting. He was young, just starting out, cared nothing for fashion, and was focused on physics. I can’t picture sharing such a small space with so many others, but when Einstein lived in this tiny apartment it was during a year where he redefined the world for us all. Later in life Einstein worked his last years at the “Institute for Advanced Study” in Princeton NJ. The institute seems a wonderful place with all any scientist could want for investigating, learning and successful theorizing. Yet, it was while living in a simple small crowded apartment, working a rather boring job, that Einstein saw the Universe as no one else had before. But at least you could get a cup of coffee. Maybe. Maybe both German and English are a foreign language? I checked my PONS, and Kaffee is either a drink or afternoon tea time. Café is a coffeehouse. Or maybe that’s just Swiss German?